High Tech Connections combines extensive R&D capability, advanced tooling technology and state-of-the-art technical facilities to produce the finest acoustic components. 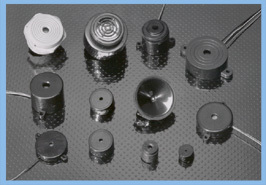 Select from miniature piezo ringers, indicators, transducers, buzzers and sounders designed for long product life cycles. These units can produce intermittent pulses, continuous tones, warbles, chirps and other unique sounds and tones. Electronic buzzers, with self-contained oscillator circuits and providing a continuous tone, are also included. High Tech Connections’ miniature sound devices produce the finest sound quality and are suitable for myriad of product applications such as in digital cameras, computer products, modems, counters, clocks and timers, pagers, toys, test instruments, medical monitoring equipment, smoke and CO detectors, intercom systems and hundreds more.